In 1964, Mount Snow’s owner Walt Schoenknecht took a leap into the future and installed the ski industry’s first skis-on gondola. The system featured brightly covered cabins allowing skiers to keep their skis on while being protected from the elements on the ride up. Schoenknecht was an innovator in the ski industry but he could have chosen a number of different designed gondolas. Struggling with back problems, Schoenknecht loathed taking his skis off. As such, he devised the skis-on gondola for Mount Snow. His $900,000 G1 ‘Telecabine’ two person gondola (also known as a bubble chairlift) debuted in March 1965. You can still see a few of the old gondolas around town. TC’s restaurant has a red one out front. 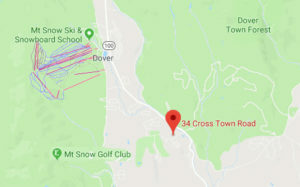 The gondola’s bottom terminal building became the now known Clock-tower Building, a core component of Mount Snow’s base complex still in use today. Here is a brief video that contains clips of Mount Snow’s two very unique gondolas. Gondola 1 was built in 1964 and put in service 1965. It which traveled all the way to the summit and Gondola 2 was installed in 1969 (three-quarters of the way to the summit) by the company Carlevaro & Savio. G1 was removed in 1986 outlasting G2. In 2011 Mount Snow debuted a new type of bubble lift. It was the new $8.6 million “Bluebird Express” lift that runs to the summit from their main base area. 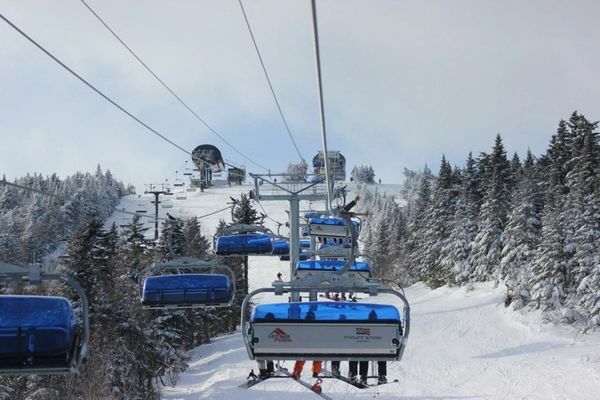 This is like no other lift you’ve ever ridden on: it’s a 6-passenger high-speed detachable lift with blue plastic canopies which drop down to shield you from wind and snow. It’s fast, smooth and a very nice ride, and even on a nice day. 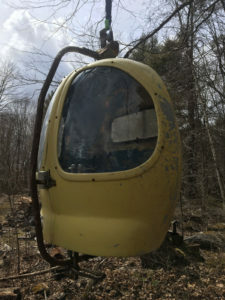 Up for sale is one, Vintage Mount Snow of West Dover, VT Gondola Car.She was in service from the mid 60’s til the mid to late 80’s.It fits two people, sitting side-by-side with their skis on.The bottom is open so you don’t take your skis off for the ride, it is known as the bubble-chair.A quick google search will give you lots of history on it.Condition: good, original condition. It has never been altered or restored.